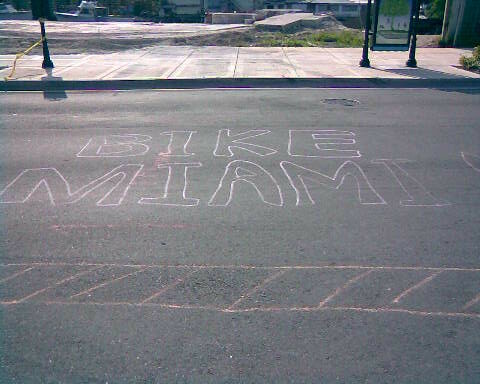 With yesterday’s Bike Miami Days, the last of the inaugural season, The Miami Herald reports that Miami becomes the top US city in regards to car-free cycling event days with a total of 7, one per month since November, 2008. The last Bike Miami Day of the season was fun, even if less attended than any I have been to (mind you, I missed Feb, Mar and Apr). Those that were there, however, had a grand old time partying at the steps of the Courthouse and riding around Downtown Miami. It was hot, probably the main reason why Bike Miami Days will go into a hiatus over the next four months, and by 2 PM the event was pretty much over. The hiatus, I think, will allow people to build up excitement for the event once more when it returns in Oct, not to mention that it will give time to the Bike Miami team to do a post-mortem of the event so far and find ways to improve on what has been, by any account, a surprise and runaway success. Many thanks to Mayor Manny Diaz and his entire team (especially to tireless Bike Miami online dynamo Kathryn Moore) for seven wonderful months of cycling wonderland, for giving me the chance to fall in love with Downtown again and for the first time, all on two wheels. You know I’ve already set the date aside in the fall. 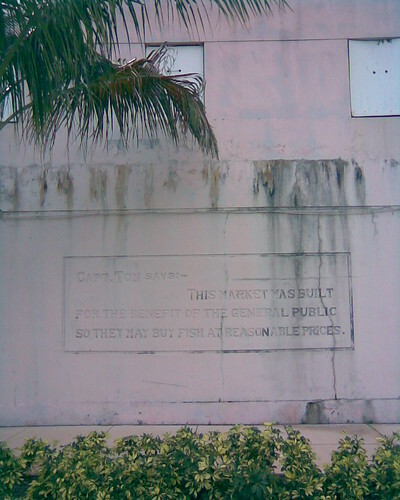 In Part 1 I talked about the Public Fish Market building by the Miami River and how it got my wife and I thinking of a possible new Miami Public Market. In Part 2, I share that daydream with you. I should tell developers that if you use any of these ideas, I fully expect to be compensated! A new Miami Public Market space centered around the old Public Fish Market, only seconds from Downtown Miami, in the middle of this historic neighborhood. The old fish market building restored, it now serves as a welcoming area to the new market, showcasing an information kiosk and visitor’s center, a short visual history of the Miami River and the public fish market, and selling branded Miami Public Market merchandise, all this alongside space for other Miami entities to promote themselves to locals and tourists alike: Bike Miami, Miami River Commission, local galleries and festivals, etc. Across the street and down NW N River Dr. there are three areas for the new buildings of the Miami Public Market. Across the old fish market/Visitor Center, Market Area 1 sits in a small island surrounded by SW 1st Street. The new building constructed here, perhaps a two-story structure, would be the new fish market building, housing vendors selling fresh fish and seafood, highlighting local and seasonal options when available, frozen as a second option to carry the vendors through the lean times. Ideally caught by local fishermen and brought to the market via the Miami River, the merchandise is unloaded at the landing right next to the Visitor Center. 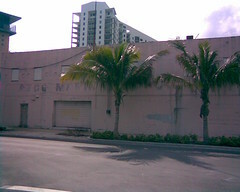 Across the street, on the other side of SW 2nd St, is Market Area 3, the location for the multi-story (at least three) main building of the new Miami Public Market. Here are housed the produce vendors, especially the local farmers and CSAs, which would receive an incentive for their presence, selling fresh and seasonal fruits and veggies. Include here (perhaps in a different floor) space for meat vendors selling non-mass-farmed (and ideally grass-fed) meats. Rounding out the selection would be locally-made foods, such as honey or jams or whatever as long as they are local and do not need to be cooked on-premise, as well as flower vendors. I’d open up some space for non-local vendors as well, but my main objective would be to get as much support going for local farms as possible (I roughly define “local” as being within a 250-mile radius, but considering our particular geography in Florida, I’d be happy to include the entire state, giving us the widest variety possible). I know this may sound a bit punctilious, but I cannot stress enough how important promoting and supporting local farmers is to the mission of the Miami Public Market. You might’ve been wondering about parking space for all the visitors the market would get. The wonderful thing is that, the parking space is already there. Wisely using the space under I-95, there are a number of large parking lots, currently closed for the most part (frankly, in 14+ years in the city I have never seen them used, though I’m not a constant presence Downtown by any stretch of the imagination). So there it is, our idea for a new Miami Public Market in the Downtown area. Would it ever get made? I don’t think so. I’m trying not to be as cynical about progress in Miami as in years past, so I’d like to think that perhaps part of the idea could be implemented at some point in the near future (and if we take the report from the Miami River Commission at face value, it seems they want to do something along those lines in this area). So, here’s hoping. On Sunday, Dec. 14, we had the second instance of Bike Miami Days, the City of Miami’s now-monthly event turning part of Downtown Miami into a car-free zone for cyclists, skaters and pedestrians to run around and enjoy. Mayor Manny Diaz and his office have been working hard to build this up as Miami’s own cyclovia, and their efforts are greatly appreciated. This sophomore effort, however, had a smaller turnout than the brand-spanking-new one in November. Considering the time of year, the at-home Dolphins game and that fact that this lacked the novelty of the previous one, I found it understandable. There were, however, quite a few participants, even at 1:30 pm when I finally arrived, so it wasn’t a wash-out by any stretch of the imagination. The Green Mobility Network once again offered free bike valet services at both Bayfront Park and Mary Brickell Village (the two bookends of the route), and as before, there was a small army of volunteers riding around ready to answer any questions. The Everglades Bicyle Club held a toy drive in conjunction with the event, which was very cool. There were also a few changes from the previous event, all of them for the better: the route was extended along the waterfront towards the AA Arena (though I was never able to find this extension), the entire route was marked with sandwich board signs with arrows marking the directions to follow, and possibly the best addition, water stations were setup along the route for participants to freshen up. Bonus points go to Kirk Jewelers for handing out water during the day as well. After the event, TransitMiami hosted a party at Tobacco Road. A bunch of the volunteers gathered there and I had a great time just chillin out after a fantastic day of bike riding around Downtown Miami. You can read my personal report over at Slow Bike Miami Beach. I never saw representatives of any of the local mainstream media outlets, televised or print, covering the event; if (IF) they were there towards the start of the day, they quickly took off afterwards. No local newspaper promoted the event leading up to it, and I have yet to see any mention of it pop up on the website of any local news show, let alone on the air. I mean, not even Deco Drive! What’s the matter with you, Miami mainstream media? You’ll cover any gory event no matter how stupid it is as long as there is enough blood and/or scandal, but an event that actually builds up community pride, highlights the city in a positive light, can be a boost for local tourism and the local economy, and shows the commitment of Mayor Manny Diaz towards making Miami an improved city doesn’t get anything? Not even a micro-post on Twitter? Shame on you. 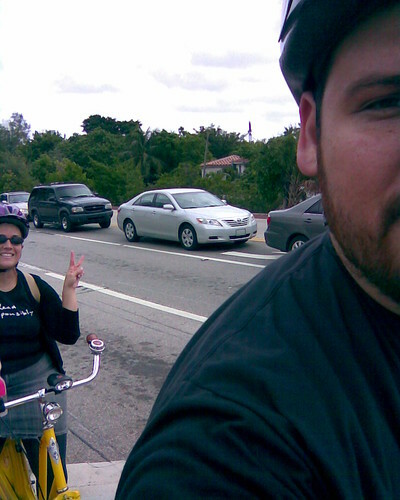 Bike Miami Days will return in January (date still to be determined). I plan to be there with my wife, and I hope everyone else joins us as well, including you, local mainstream media.